Pesto Besto only takes 15 minutes to make. Note: Many of the links included throughout Recipe Idea Shop are affiliate links, which means if you follow them and you buy something, we will get a small commission. It doesn’t cost you a penny more, and you can still use your Amazon Prime account to buy. This posting includes affiliate links. Hi. Don here. Pesto Besto is a wonderful basil coating for all sorts of pasta. 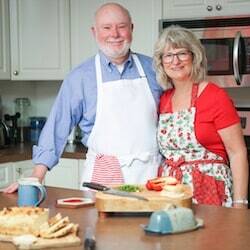 My sister-in-law, Judy, taught me how to make this simple, yet delicious sauce. You can make it in 20 minutes, including picking the basil leaves. Try it on Pesto Pasta Shrimp. 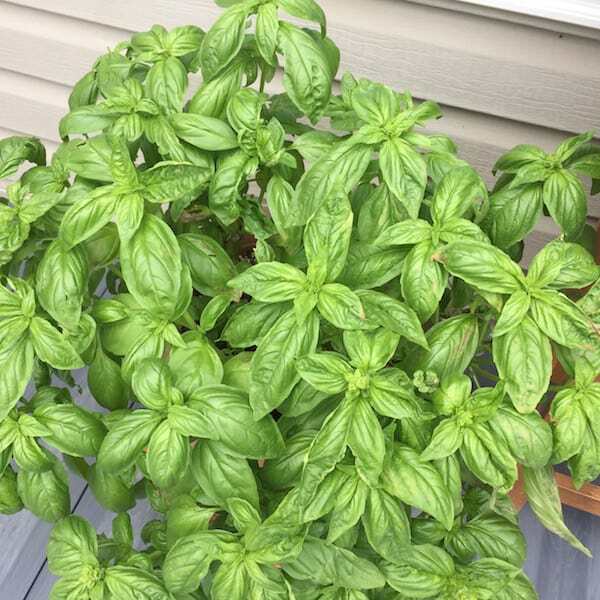 When the fresh basil is abundant in the garden, I make several batches and freeze them to eat all year long. I put it into plastic zipper sandwich bags and freeze it. Or, freeze it in ice cube trays and then save the cubes in a freezer bag to pull out a cube or two when you need some Pesto Besto. 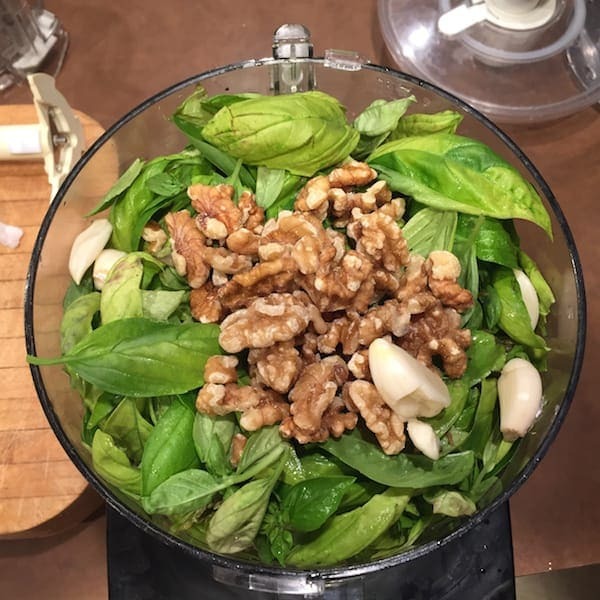 Chop up basil, garlic and walnuts together. This recipe can be easily halved or doubled. The basic recipe is enough for more than a pound of pasta, serving 10-12. A double recipe easily fits in our four-cup food processor. 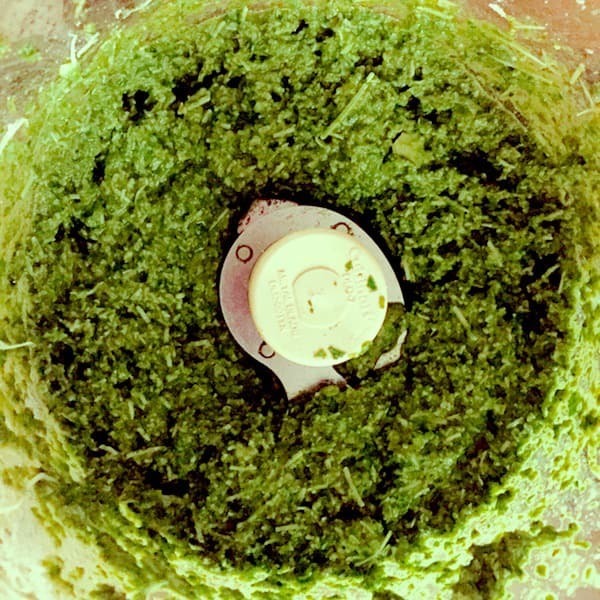 A food processor or a good blender is a necessary tool to make Pesto Besto. 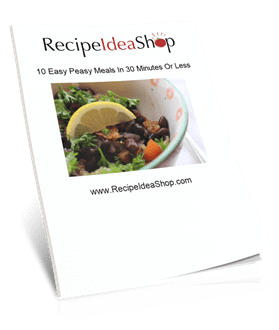 Did you grab your FREE cookbook? The only special tool you need is a food processor or blender, but you will also need measuring cups, a knife and a hard cheese grater, similar to those shown below. In a food processor grind the basil, garlic and walnuts. Slowly add the olive oil until the pesto is smooth but not runny. Add the cheese and whirl until combined. To serve, toss cooked pasta with the Pesto Besto until it’s coated to your liking. We use about 1tablespoon of Pesto Besto per person. Pesto Besto Nutrition Label. Each serving is about 1 tablespoon.